« From analysis to action – What can we learn from the UK party leaders’ earned social media publicity? For some time now it has been trendy to predict the abolition of various professions. This is the consequence of increasing hype around robotization, machine learning and artificial intelligence (AI), and the resulting automation of work. In the future digitalization will create many new jobs, ones that we even haven’t heard today, but as people often have talent for drama, the emphasis has been in the ones that will be lost. 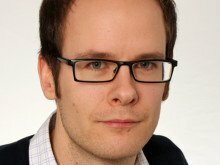 Clearly, the development of machine learning and AI have had, and continue to have, a serious effect on information business as well. Tasks, such as data search, collection, processing, visualization, and tone sentiment represent functions that are already now automated, at least to a degree. What will happen to data analyst, such as myself, in this equation? 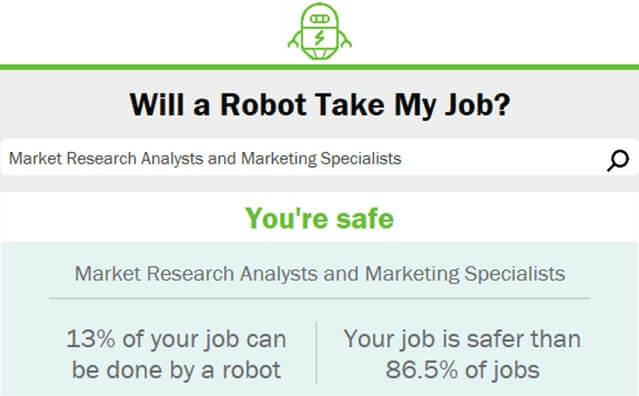 There are online tests that estimate the likelihood of losing a specific job for automation. According to one such test, based on a recent report, my job is safe, at least for now (note: in the absence of ‘data analyst’ title, the closest match ‘market research analyst’ applied here). Even though the accuracy of this type of tests is sketchy at best, those offer us glimpses of direction of the change. All job descriptions include tasks that could be automated, in some more than others. From a business stand point, it makes total sense to automate more trivial jobs, allowing people to focus on more complex tasks that create more value. In my role machine learning and human intelligence go hand in hand, complementing each other. Processes such as data mining, search, collection, and classifying are automated, but these also require human intelligence in the setup and management. Basic KPI’s, visualizations and dashboard graphs can be generated automatically. However, when moving into more complex tasks, such as content analysis, production of written summary, drawing conclusions, and making recommendations, human intelligence is a must. Human intelligence cannot be replaced, at least in the near future, in data analysis. As described above, when the difficulty factor rises, the amount of automation decreases. There’s a continuous trend for more sophisticated analysis and analytics. Instead of a mere descriptive approach, there’s an increasing demand and pressure for analysis to focus more on diagnostic, predictive and prescriptive content. Customers want conclusions and recommendations, and understand the added value of providing a vision. The changes in media have hardly gone unnoticed by anyone. There’s an abundance of data and it is more ambiguous than ever. The borders between facts and propaganda are blurring, and often it’s difficult to distinguish where one ends and other starts. A recent report concluded that the fake news syndrome has boomed into a serious industry. “Products” can be bought directly from the shelf with clear descriptions and prices. For example, with USD 5 000 one can buy 20 000 comments in social media, and an imaginary “celebrity” profile is created for USD 2 600. A yearlong influencing campaign to “manipulate a decisive course of action” would be a USD 400 000 investment. Having witnessed the development of technology and digitalization, I’m fully aware that the likelihood of a robot taking my job may well increase in the future. However, should the current trend, including the increase of the amount of data, the demand for analytical vision, and disinformation in media, continue, I’m fairly confident that the percentage will not increase too high. What is certain, the future will create various new tasks and opportunities within the information industry. Let’s shift our focus more on anticipating the change and celebrating these new opportunities, rather than worrying about the things that the world forgot.